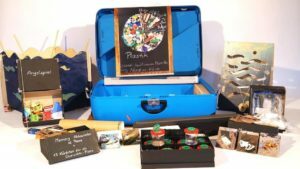 The learning case contains various materials with which the contents of the PIWI book can be explored and increased; it lets children learn by doing and feeling. The various materials present a wide range of aspects to help visualize and learn the problems involved. The teachers can decide whether to work with the complete case or just use parts of it, depending on what they want to focus on. It is necessary that the children are accompanied when working or playing with the materials in the case. If you are interested, the educational kit can be requested here on our german homepage. Please note the free lending times given there. The case will be delivered a week before the lending period by DHL. There is not a fixed delivery date or time; that means the driver can turn up any time during the day. If required I can send you the tracking number so that you can track it online: Please ensure that someone is around during the day to sign for the case. This is especially important in the case of institutions, which may only be open in the mornings. At the beginning of the lending week you will receive a letter with a filled-out card for further transport. This is already filled out and on the sleeve, so that you just need to remove the old sleeve and fit the new one on the handle of the case. Postage is then already pre-paid. After the case has been used we organize the further transport. DHL will be given the order online. Pickup is normally the Monday after the lending week. You will be informed by mail about the date. The pickup date must be held to allow for the next borrower to receive the PIWI learning case on time. As on delivery the DHL driver must be able to pick the case up on the indicated day. Pickup is not at a fixed time but can take place at some time during the day. Please contact me directly should any delays or problems come up. I look after the PIWI learning case on a voluntary basis and will be pleased to help. If you do not get me immediately I will come back to you as soon as possible. Please leave a telephone number under which I can contact you in the afternoon too.